Add a cup of sour cream, a cup of mayo and you've made a terrific homemade dip in no time with Gourmet du Village Cheddar Onion Dip Mix that is wonderfully flavorful, award winning dip mix. 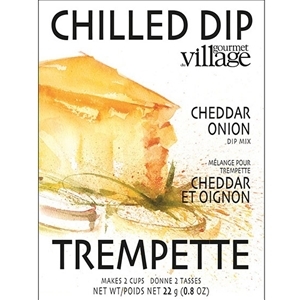 Gourmet du Village Cheddar Onion Dip Mix is their best selling dip mix and is full of zest and just the right seasonings. They make delicious spreads for sandwiches, panninis, burgers and great as a dipping sauce too! Add mix to sour cream and mayonnaise. Mix well. Chill for 1 hour before serving. Dehydrated onion, cheddar cheese powder ((milk ingredients, bacterial culture, salt, rennet and/or pepsin and/or microbial enzyme, may contain calcium chloride), modified milk ingredients, hydrogenated soybean oil, salt, disodium phosphate and lactic acid)), buttermilk, dehydrated garlic, spices, paprika, corn starch, hydrolyzed corn protein with Mix 2% soybean oil.